Change is an inevitable process that every organization must face and successfully manage if they want to remain competitive and grow. Since most people are naturally resistant to change of any kind, it is a leader’s ability to effectively frame change will make a significant difference in how it is viewed and embraced by your team and is often the difference between success and failure when it comes to adoption. Many organizations implement change — but the key is to introduce it in a way that will make it stick. Naturally, leaders will deal with internal resistance — this is normal. If you want your team to accept change and make it stick, you need to frame it in a way that will tap into people’s emotions. This is why leaders have to make the concept of change real for people — it cannot exist as a conceptual theory. You need to effectively communicate what change will be taking place, and how it will impact each member of your team from the top down. How can you tap into people’s emotions? Inspiration: With change comes the opportunity to inspire. Use the prospective change to inspire your team about what is possible. The desirable end results will open them up to change, and also interest them in adopting change for the long term. Opportunity: When change is proposed, discuss the new opportunities that will be presented to each and every individual. Answer “What’s in it for me?” for each person so they start to see the personal benefits of the direction the organization is going. Input: Give your team the floor. Make it easy for them to openly discuss their concerns and raise questions about how change will impact them personally and professionally. Set a realistic time frame and structure for change to take place. Schedule discussions, open forums, and meeting to help your team understand, accept, and adopt. Be ready and willing to have open discussions that raise concerns. changes you are undergoing are having a positive impact on everyday activities and outcomes. Making change stick is challenging. But, with the correct approach, leaders can make it stick. Tie change into your vision and values: It is important to communicate how change reflects the organizations’ core values and how it supports the company goals and objectives. Make change matter from an individual perspective: When communicating change, tie it into what matters to your team. Depending on the individual, it could be an expansion of duties, increased responsibility, or personal growth opportunities. Find champions at all levels of the organization: It is important to identify people that champion the idea of change at all levels of your company. They can provide support and help motivate others to accept change so it will stick. They can also put out mini fires and address misinformation about the changes being made. Provide training to support the change: Offer training and information sessions to ramp up individual skills and knowledge that are needed for people to be successful in the new environment. Also, make sure that ongoing support is in place to reinforce the value of change. Expect accountability: You need to hold people accountable by tracking the success of implementation and through recognition and reward — offering rewards alone will not create the desired change in culture. Making change stick is challenging. But, with the correct approach, and framing it in a way that will be accepted positively by your organization, transformational leaders can make change stick and have it become part of your company’s culture. It is a little old hat, and maybe simplistic but I do like the skill or will question. 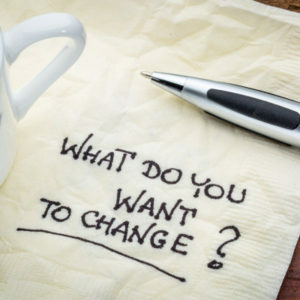 Do your staff have the will to change? Do they have the skill to change? Once you know the answer to that then your interventions start to attack the real blockers. I like that question too. I use the term character vs. competence. Unfortunately, too many companies focus only on skill and don’t pay attention to will. And then they can’t figure out why they keep pouring resources into skills training and not seeing a change in results. Getting clarity about the underlying issue is always a first step to determining the best solution. Thanks for reading — and your comment.